What a difference a month made. When we came into May, the National League East standings looked far different than what we see now. The New York Mets were atop the division, the Atlanta Braves and Philadelphia Phillies were two big surprises in the league, the Washington Nationals limped through the first month, and the Miami Marlins were… the Miami Marlins. As we turn the page to June, we now have a better idea of what this division is going to look like moving forward. We saw the rise of some, the fall of others, and we also have a good perspective of what teams’ plans are as we move closer to the July trade deadline. With that being said, here is everything we learned from the NL East in the month of May. April was a month that the Nationals and their fans want to forget. The team was loaded with injuries, hitters struggled at the plate, the pitching was inconsistent, and they couldn’t find answers for any of their problems. For a team that was heavily favored to win the division as well as the National League pennant, they knew they had very little time to turn it around. When the calendar turned to May, everything changed in the nation’s capital. The Nationals went 19-6 in their last 25 games, they are winners of six straight, and they now find themselves in first place in the NL East thanks to the Braves’ loss to the Mets last night. The offense has come alive and many that were struggling are now starting to find their groove. Bryce Harper, while his numbers may not show it, is finally starting to find himself at the plate as he has recorded six hits in his last seven games, including three home runs. Harper is slowly but surely building up his batting average and his confidence at the plate. It won’t be long before he gets going for real. The biggest surprise in my opinion has been Mark Reynolds as he has been a huge addition to the Nationals lineup since being called up. Currently batting .375 since joining the club which includes six home runs, he has been the difference maker that Manager Dave Martinez knew he could be in place of Ryan Zimmerman. If you thought the offense improved, the pitching has been lights out, especially from Max Scherzer who is 8-1 with a 2.13 ERA and hasn’t lost a start since April 4 against the Braves. Stephen Strasburg has found his way back after a sluggish start going 4-1 in May with an 2.51 ERA. The bullpen has also turned it around recently as they have only given up two runs in their last nine games. This is due to the great work from Sean Doolittle, Justin Miller, and Brandon Kintzler, just to name a few. There is one problem for the Nationals that is only getting worse, and that is the injuries. They have 12 players on the disabled list which still includes Zimmerman, Daniel Murphy, Adam Eaton, and most recently Howie Kendrick who ruptured his right achillies and is likely done for the year. However, even with all the injuries to their prime players, the Nationals still find a way to rise above the setbacks and play like the contender they are. If they continue this type of play when their injured stars come back, the rest of the East is in trouble. Ready or not… HERE COME THE NATS! I mentioned in my first article “What We Learned From the NL East in April” that the Braves were off to one of the best starts in the league, but not to read much into it. Two months into the season, they’re playing at a high level and the entire league better be paying attention. While they have slightly struggled recently, loosing six of their last ten, the Braves still find themselves in a great spot going into June sitting just 0.5 games back of the Nats. Their offense has been the biggest key to their success with players like Nick Markakis who is second in the league in hits, Freddie Freeman who has been a valuable weapon batting over .330, all the way to Ronald Acuña Jr. who has been a huge part of the Braves lineup since being called up. Their offense ranks in the top five in almost every positive offensive category in the league including batting average, slugging percentage, hits, RBI’s, and stolen bases. While this may be a team that has a great offense and doesn’t strike out a lot, their pitching could use some improvement. Some examples are Brandon McCarthy who currently has an ERA of 5.02 giving up 34 runs in 11 starts, and Julio Teherán has also struggled to keep his ERA low. While the pitching has gotten better in some areas like earned runs and hits allowed, they still lead the league in walks, their bullpen is starting to fail in big spots, and their team ERA is higher than many would like. So, if the Braves stay in contention, expect them to look for help in the starting rotation as well as the bullpen come the trade deadline. Overall, the Braves are one of the better teams in the National League at the moment. It is clear these aren’t the same rebuilding Braves we have seen over the last few years. This team is easily a year or two ahead of schedule and they don’t look like they’re stopping any time soon, but they are about to be put to the test. The Braves will meet up with the Nationals for a huge four-game series beginning tonight in Atlanta with first place on the line. With the Nationals’ recent hot streak, this is no question a matchup where the Braves have to show the world that they are ready for the challenge. While I believe the Braves are for real and can be a contender come September, this series will show us just how these young Braves react with their toughest task to date coming to town. PHILADELPHIA PHILLIES: ARE YOU TRUSTING THE PROCESS? Remember in the beginning of the season when fans wanted Manager Gabe Kapler fired when the team started 1-4? Good times. It’s been a much different story since as the Phillies are just about where many saw them at this point, and that is as a contender in the NL East. This team is different than years past, and one that I picked to have a great season and a possible spot in a wild card race if all goes their way. Their biggest key is to stay healthy, and besides a few hiccups, they have done just that, and they have shown what they can do. Starting with what has been their biggest key to success and that is the pitching, which overall has been fantastic as they have given up the lowest amount of runs in the National League. Jake Arrieta and Aaron Nola have been nothing short of productive in the starting rotation as they have two of the top five lowest ERA’s in the National League. Arrieta actually posted his best ERA in a month since September/October of 2015, the same year he won the NL Cy Young award. Good luck to batters facing @JArrieta34. This is his best ERA (0.39) in a month since Sept./Oct. of his 2015 Cy Young season. While the pitching has gotten the Phillies by, the offense does need to be more productive. The team is batting .237 which is 22nd in the league, they are 28th in the league in hits, and the team is in the top 10 in the league for most strikeouts with 511. The Phillies also heard news yesterday that Rhys Hoskins is likely to be put on the DL with a fractured jaw that he suffered after fouling a ball off his face on Monday. For a player leading the team in stolen bases as well as a productive player on offense and defense, this is the wrong time for him to land on the DL. Even with an offense that is hit and miss at the moment, they are still right there with the Braves and Nationals, so it should be noted that the Phillies need to look for help at the plate come the trade deadline in July. 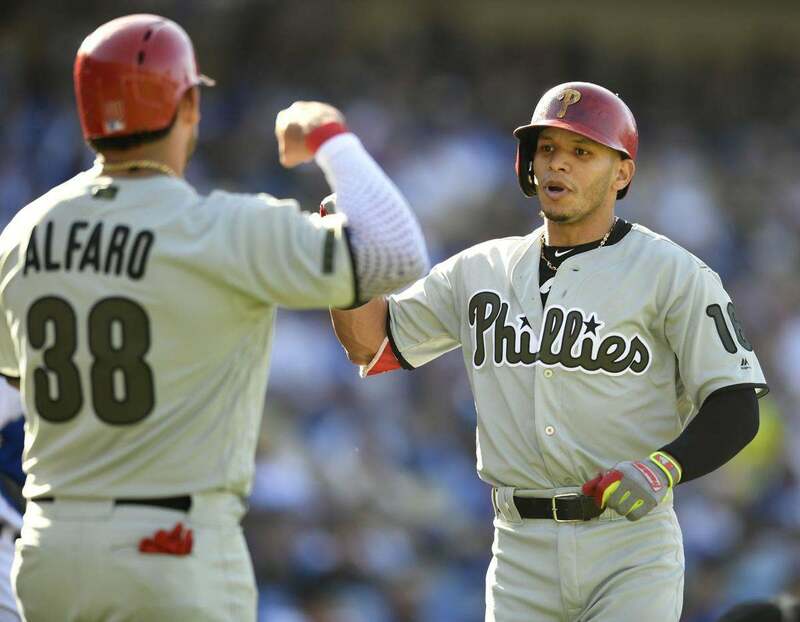 In the meantime, look for players that are hitting well like Carlos Santana, Obúbel Herrera, and Jorge Alfaro to be the table setters and help motivate this starting lineup. Overall, the Phillies are here to stay and as long as the offense improves (which it will) and the pitching stays as dominate as it has been, it’s going to be a special year in the city of brotherly love. Mets fans keep asking themselves, “What else could go wrong?” How about the stadium catching fire, because if yesterday’s fire at Citi Field didn’t accurately sum up what this season has been like so far for the 2018 Mets, then nothing will. I only ask myself one question, how did this team go 11-1 to begin the season? This Mets team, from game #13 of the season to today has been nothing but the biggest embarrassment and the biggest laughing stock in the entire league. From an offense that is hit and miss, to a defense that has cost the Mets close games, to a starting pitching staff that has struggled, to a bullpen that isn’t good enough to tie the cleats of 10-year-old little leaguers, this team is simply BAD! There was a reason I picked this team to finish third at the beginning of the year. The biggest reason for that was their bullpen, which has been a DISASTER this season. Every time you turn around the bullpen blows another game. Players like Jerry Blevins, A.J. Ramos, Paul Sewald, and many others have been nightmares to watch for this team. The starting rotation overall has struggled, but the Mets have gotten good work out of Noah Syndergaard and Jacob deGrom, as expected, but Steven Matz and Zack Wheeler really need to improve. Don’t even get me started on Jason Vargas. The offense hasn’t been that bad, especially recently, whenever the starters needed run support they got it. From players like José Bautista, Devin Mesoraco, Asdrúbal Cabrera, and many others, the offense has actually clicked in big spots, especially against big competition. But fans continue to hold their breath every time Manager Mickey Callaway takes out one of the starting pitchers. Now, I understand there are injuries, 12 to be exact, which has been a huge blow to the Mets, especially the injuries to Yoenis Céspedes, Todd Frazier, Juan Lagares, Syndergaard, and many others. But these problems were forming before the big injuries occurred. Overall, I think we have already seen enough of what we have in front of us. The Mets went from “The magic is back,” back to “Same old Mets” in a span of 30 days. The injuries aren’t getting any better, the window for a World Series Championship closed two years ago, and there is nothing left with the current product on the field. If you ask me today, “Is it time to rebuild?” Unless they turn this thing around this weekend against the Chicago Cubs and have an incredible June, the answer is yes. It’s not 2015 anymore, and this team isn’t getting any better. Get ready for five to seven years of suffering, if management does this correctly. The Marlins are still on track for one of their worst seasons in franchise history. The team is playing strictly with prospects while their best players that were traded away are pushing themselves to their fist winning seasons of their careers. What’s laughable about this whole thing isn’t the fact that the team is bad. That’s called rebuilding and something that every team has to go through in order to be successful, look at the Braves and the Phillies this year. What’s laughable is that Owner Derek Jeter actually expects this team to go out and contend. Bryant Gumbel and Miami Marlins CEO Derek Jeter engage in spirited conversation on Tuesday’s all-new Real Sports. #RealSportsHBO Subscribe to the HBO YouTube Channel: https://goo.gl/JQUfqt Don’t have HBO? While I can respect Jeter’s mindset as an executive to believe in the players he has, he needs to be realistic of what he has in front of him. Is he rebuilding for a future? Yes, as he should. The Marlins were in need of a rebuild for years, but he needs to look on the field and realize that this team simply can’t contend. The team has the second worst record in the National League behind the Cincinnati Reds, they are 30th in RBI’s, 26th in hits, their pitching has an ERA of 4.94, and they have given up the 5th most runs in the league. As I mentioned in my April edition of “What We Learned From the NL East,” they have an offense that is almost non existent. Besides players like Starling Castro, J.T. Realmuto, and Brian Anderson, nobody is contributing in this starting lineup. On top of that, the pitching has been horrendous. José Ureña has hit rock bottom since April as he is currently 0-7 with a 4.69 ERA, Dillon Peters has been awful in the six games he’s appeared in giving up 18 runs, and Caleb Smith can’t seem to catch a break as he has pitched very poorly this season. The Marlins are in for some hard times, not just this year, but for many years to come. The best thing they can do is hang in and keep the rebuild going. However, the Marlins won’t be able to successfully rebuild until Jeter accepts the rebuild for what it is, instead of being in denial of it. What is your take on where all five teams stand in the NL East? Follow me on twitter @SMMcChesney to see all my posts and discussions on all teams in the NL East during the 2018 season.